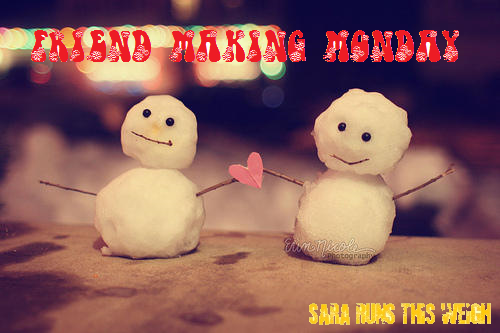 Sara Runs This Weigh: Friend Making Monday: Winter is Coming! So sorry...I started cleaning house and totally forgot to post this. I can't believe I forgot! I should start doing this as a scheduled post so it posts first thing every Monday morning! Anyway, here we go! 1. Are you excited that winter is coming? Why or why not? Yes. I’m a runner and I love to run outside and the cooler, winter weather means I don’t overheat as easily and I don’t get as thirsty on my runs. It also means I chafe less because I’m usually wearing long sleeves. 2. Does it snow where you live? If so, do you play in the snow? If not, did you used to or do you wish you did? No, not really. I mean, every few years, we get a “dusting” of snow but it rare “sticks” and even if it does, it doesn’t last. The ground just doesn’t get cold enough here to support a ground cover of snow. I used to live in Oregon and it snows there. 3. Do you ever take any winter trips? Not normally. I did go home to Oregon a few years ago to visit my friends and family. It was pretty cold (got down into the teens and there was even a mild blizzard that closed the airport the day after I flew back to Texas!!!) and it did snow while I was there. 4. Do you or have you ever participated in any winter sports like skiing? If so, tell us about one of your more memorable times. When I was younger, my family would go skiing a couple times a season. Also, my brothers were in boy scouts and their troops would rent out this place on Mt. Hood called Snowbunny Lodge where we would stay for a weekend and would ride large inner tubes down the snow covered hill all day. It was so much fun! I miss those winter weekends at Snowbunny. 5. If you exercise and you exercise outside, how do you deal with the cold? I do. I hate running on the treadmill so I only do it if it’s not a good idea to run outside and ice on the ground would be one of those reasons. Other than that, I run outside no matter what. If it’s cold, I just layer strategically to keep myself warm, but not too warm. Sweating in freezing temps isn’t safe. If you’ve ever seen any of the Survivorman episodes that takes place in cold, snow-covered locales, you will hear him harp on this fact. 6. Do you eat/drink anything at this time of the year that you don’t the rest of the year? I will have hot chocolate from time to time in the winter and I tend to like to eat warm foods. I’ll also be more likely to get a skinny mocha latte from Starbuck’s if it’s cold outside than if it’s not. 7. What is your favorite thing about winter? This comes strictly from the runner in me, but I love running in the cooler and cold temps more than I like suffering through the Texas summers with their heat and ridiculous humidity. 8. What is your least favorite thing about winter? If it gets icy here in Texas, nobody knows how to drive in it and they get in way more accidents than needs to happen. 9. Do you or have you ever attend(ed) any holiday or winter themed parties? Yes. For the past few years I have attended my agencies Christmas parties. A couple years ago, I got extremely intoxicated and made a fool of myself (I didn’t DO anything, I just sat there staring off into space and then threw up a lot) and since I haven’t had more than 2 drinks in one sitting. And I now enjoy the parties a lot more now that I attend them sober. Haha. 10. When does it start getting cold where you live? Right around the first week of December…like the first weekend. And it happens all of a sudden. Like, one day it’s in the mid 70’s and bam the next day a cold front blows in and it’s in the low 40’s. A few years ago I had a bunch of plants on my patio and this happened and they all died…that really sucked.